An intense and precedent-setting legal battle is ahead, and it could drag on for a while. With the support of our members and other public lands-loving Americans, we expect to win. But while we battle it out in court, Bears Ears and Grand Staircase-Escalante will be opened to the scourges of development and visitor misbehavior, among other things. Moving beyond the rhetoric and political gestures, here are a few of the actual, on-the-ground threats to these public lands, beginning with the most imminent. The land cut out of Bears Ears and Grand Staircase-Escalante National Monuments will remain public, but it will not enjoy as high a level of protection as before Trump's decision. One of the most immediate concerns in these areas is re-opened roads and reckless all-terrain vehicle (ATV) use. Motorized vehicles will now be allowed on any road that existed prior to the establishment of the monuments. That may end up being hundreds of roads, thanks to an oft-exploited law passed in 1866. Utah county governments have used the statute to claim that derelict or disused old settler trails count as current roads. This has included more than 1,400 miles of routes claimed within Bears Ears and 2,000 miles of routes within Grand Staircase-Escalante. So we could see huge swaths of wildlands suddenly overrun by vehicles now that the monument boundaries have been drastically contracted, isolating the still-protected sites as small, disconnected islands amid oceans of disruptive traffic. The Trump administration's new declarations specify they "may allow for active, science-based vegetation treatment" in both Bears Ears and Grand Staircase-Escalante. This will likely lead to a range of destructive activities meant to replace native plants with perennial grass cover. One of the most viscerally upsetting is so-called "chaining," in which bulldozers drag enormous chains across the desert to uproot trees. Research suggests this practice—which is likely to be among the first undertaken in the newly un-protected landscape—can suppress tree growth in the area for decades after the fact, especially impacting the piñon pine. 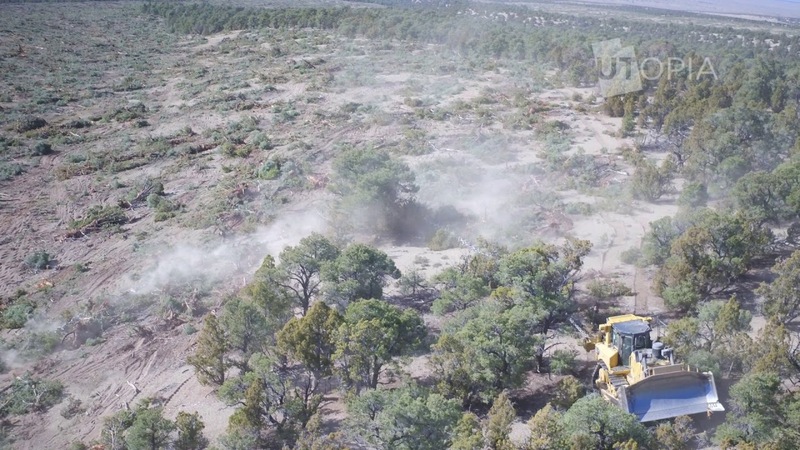 Chaining also reduces biocrust, a thin layer of organisms on the soil surface that help maintain the desert ecosystem, and leads to increased wind and water erosion. With Trump's decision, priceless archaeological and cultural sites in Bears Ears will be vulnerable to looting and vandalism, as they were for years prior to monument designation. Rock art, cliff dwellings and other cultural sites now fall outside the monument boundaries, meaning less oversight for a piece of public land already extremely short on staff. A similar situation faces Grand Staircase-Escalante. The proclamation for Bears Ears also called for changes in the commission overseeing the monument that tribes say excludes key voices while elevating those hand-picked by anti-public lands interests. An attorney with the Native American Rights Fund characterizes a bill that more or less codifies Trump's decision as an attempt "to dilute and silence the tribal voice." It is unclear what exactly this will mean for the monument, but it's safe to say it won't involve more buffers and protection for critical tribal sites. There are estimated to be more than 3,000 "scientifically important" fossil sites in the full Grand Staircase-Escalante National Monument, and Trump's cuts would leave out more than 400 of them, including many potential dinosaur finds and a large section of Triassic petrified forest mentioned in President Bill Clinton's original proclamation establishing the monument. Bears Ears has not been studied as extensively by paleontologists, but is considered ripe with potential; Trump's virtual elimination of that monument will strip protected status from a major Triassic bone bed, among other sites. This is why, in addition to Native American groups and The Wilderness Society, the Society of Vertebrate Paleontology is among those groups suing Trump over his monument cuts. Paleontologists worry that with former monument-protected land reverting to a less protective level of "multiple use" management, mining and other activities will come to take precedence over fossils. In the meantime, fossils will be exposed to vandalism, which is already a huge problem at some national monuments and would be even more so for tracts of land that lack that level of staff and resources. Cuts will also interfere with research and perhaps even halt some projects entirely (a great deal of funding that led to major fossil finds in Grand Staircase-Escalante came through the monument, including the resources to airlift a rare, nearly complete tyrannosaur skeleton out of a now de-designated monument area earlier this year). The price of uranium is currently too low to expedite mining on the land, but that is not a permanent state. Similarly, while the area formerly protected as Bears Ears is not considered a high-potential spot for oil and gas drilling at the moment, that could easily change with market fluctuations and the development of new technologies. Meanwhile, Trump's contracted borders for Grand Staircase-Escalante carefully tiptoe around coal deposits (see below), opening the door for coal mining operations on former monument lands. That could mean thousands of acres dug up and stripped, waterways polluted with soil and contaminants and wildlife driven away by dust and noise pollution.